You only have to catch a fleeting glimpse of those fluttering robes to know what has just passed you. The Spirit of Ecstasy is an undeniable icon of automotive design and unparalleled luxury. Over the past 106 years “The Flying Lady” has graced the hoods of ever Rolls Royce produced; she is an unwavering symbol of tradition amongst over a century of constant change and innovation. She is stability and poise. The Spirit of Ecstasy combines the acknowledgments of art and engineering into one truly stunning figure. The design was based off Sykes’ bronze statue “The Whisperer” and modelled on Lord Montagu’s private secretary Eleanor Thornton. All Spirit of Ecstasy figurines are made using either 24-carat gold, sterling silver, glass or stainless steel. There is also an illuminated option. Lord Montagu was the founding editor of The Car Illustrated Magazine, hiring Charles Sykes as his illustrator and Eleanor Thornton as his private secretary. During 1909 Lord Montagu owned a Rolls Royce Silver Ghost which he commissioned Sykes, also a talented sculptor, to create a mascot for. The resulting design was a bronze statue called “The Whisperer”; depicting a young woman in fluttering robes and holding he finger to her lips. Although there have been many theories thrown about over the decades, there is a fierce debate between two opinions: is it a subtle hint at Lord Montagu’s close relationship with Eleanor? Or simply a reference to the engine’s relative quietness? Regardless of how that debate ends, the fact remains: The Whisperer became Lord Montagu’s token ornament on each of the Rolls Royces that he owned. In 1911 Rolls Royce General Managing Director, Claude Johnson, commissioned Sykes to design an official mascot, to protect the prestigious vehicles from modification following a number of other Rolls Royce owners who followed Lord Montagu’s suit and commissioned their own mascots. With a simple reinterpretation of The Whisperer, Sykes created the now-famous Spirit of Ecstasy that the world now identifies with the upper echelon of society. 1970’s: a number of countries including Switzerland, banned the Flying Lady due to safety concerns. Customers’ newly delivered vehicles often lacked the iconic mascot, only to be found detached and hiding in the glovebox. Typically ingenious, Rolls Royce created a spring-loaded base for their mascot, which allowed her to gracefully lower into the radiator; eliminating the safety issue. Eleanor was unfortunately killed when the SS Persia, on which herself and Lord Montagu were travelling, was torpedoed off Crete. Lord Montagu was later discovered to have survived, even making it back in time to read his own obituary in The Times. Rolls Royce saw a new era begin in 2003 in preparation for launching their new Phantom. The BMW Group decided to refresh and update the Spirit of Ecstasy, keeping close to her roots and paying homage to past vehicles and mascots, whilst also marking a new chapter for the historic company. Producing such an iconic figurine requires great skill and patience: up until 1999 the figures were made using a “lost wax” technique, with Charles Sykes, assisted by his daughter Josephine, personally casting, inscribing and finishing every single Spirit of Ecstasy for every single Rolls Royce until 1939. Quite a phenomenal skill when you look closely at these iconic “flying ladies”. The modern-day figurines are made by a specialist company in Southampton, England using a modern casting process. 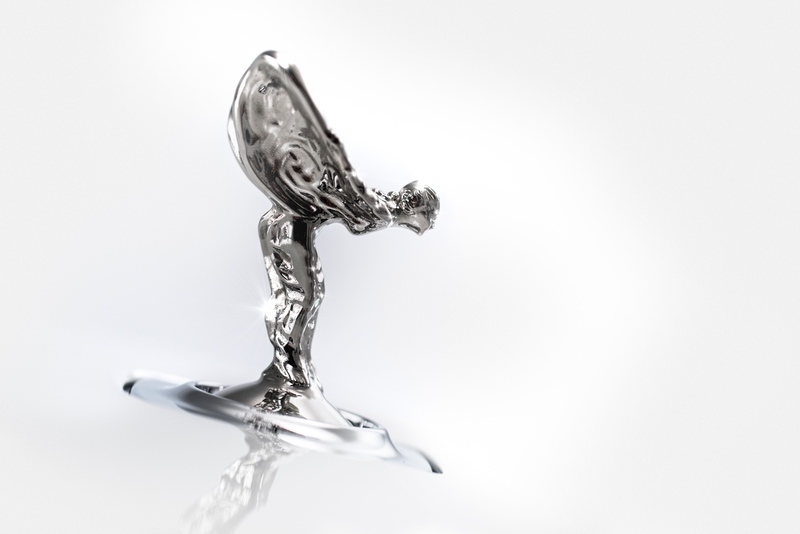 By digitally mapping the original Spirit of Ecstasy and enhancing or manipulating particular details digitally, the modern incarnation was able to be brought to innovative perfection, creating a flawless three-dimensional digital image. Craftsmen used cutters measuring just 0.2-millimetres when crafting the injection mold to ensure that every miniscule detail was replicated with absolute accuracy. 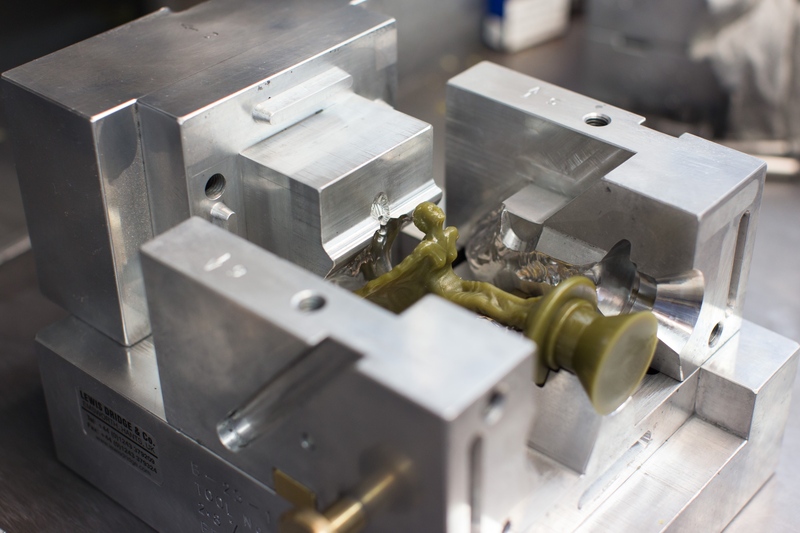 This “injection mold” then allowed a wax model of the Spirit of Ecstasy to be made, which then went on to be encapsulated in a layer of ceramic coating. This creates a perfect “female” mold of the figure, which when the trapped wax is melted away, allows countless mascots to be cast for new vehicles. These new “female molds” can withstand incredible heat; they are filled with molten stainless-steel which is heated to 1600 degrees Celsius, then a perfectly formed Spirit of Ecstasy is revealed when the steel has cooled and the mold opened. The finishing process requires an separate department for that stage entirely, where mascots undergo a number of treatments to truly perfect their form. The first of these processes is called “peening”; millions of stainless steel spheres with a diameter measuring a mere 17-thousandths-of-an-inch (0.04-millimetres) are blasted around and against the figurine, allowing a smooth finish without the hindrance of abrasion. After the peening process comes a final mirror-polish and then each Spirit of Ecstasy is inspected under absolute scrutiny for even the tiniest of imperfections. Finally, once all treatments and checks are complete, the “flying lady” is packaged safely and sent forth on its journey to Goodwood, where Rolls Royce master craftsmen place her proudly atop the nose of her particular vehicle. Rolls Royce motor cars are easily one of the most customizable production vehicles on the planet: no two are alike and owners relish the idea of such individuality. However, one constant with these vehicles throughout history has been the beloved Spirit of Ecstasy. Rather simply: why change something that has already achieved perfection? Within reason owners are afforded the opportunity to change elements of the mascot: namely the materials from which she is produced. Modern-day customers have the option of solid silver, illuminated or 24-carat gold-plated; the ultimate status symbol. One of the few incredibly unique figurines belongs to Mouawad Jewellers who created a centenary-model figurine robed in diamonds and valued at an astonishing $250,000. The Spirit of Ecstasy has been celebrated in many different ways over the years: most recently in 2011 with the launch of The Centenary Collection. This collection was limited to 100 bespoke models of Phantom for favoured customers; features included wood veneers, leather combinations, interior details and exclusive body colours, as well as a solid silver Spirit of Ecstasy which was specially-commissioned. This exclusive silver mascot featured six hallmarks, two of which were designed for Rolls Royce specifically and sat atop a black-gold plated illuminated base. Also in 2011 was a specially commissioned series of images by famous British portrait & fashion photographer Rankin. The images were inspired by the iconic Spirit of Ecstasy and were shared around the globe both online and as hard-copy prints to celebrate the famous mascot’s centenary. The spirit of Ecstasy had been an icon, a constant in an ever-changing industry, and an immediately identifiable badge of honour (or “statue of honour”, if you will) for the Rolls Royce brand; their owners, fans, employees and of course, their vehicles. Spirit of Ecstasy carries an air of grandeur and mystique with her wherever she roams, as she always has. We certainly look forward to watching her ride the crest of success and wealth for the next century to come.